Discussion in 'Non-Indian Domains' started by Prashant Sharan, Apr 12, 2019. Let's look at the market's performance on 10th April, 2019. GoDaddy had the top sale of the day for two days in a row, this time it was BLive.com which sold for $13,250. NameBio recorded 291 sales $100+ for a total of $150,556 with an average sale price of $517. Compared to the previous day there was a decrease of 6% in the number of sales and the total dollar amount decreased by 1%. We also recorded an additional 1,450 sales below $100 for a total of $38,504. The domain FoodDiscount.com sold for $500 at Flippa for an increase of 201%. It last sold for $166 on December 12th, 2018 at NameJet. The domain WorldFone.com sold for $647 at GoDaddy for a decrease of 68%. It last sold for $2,000 on September 26th, 2012 at Sedo. The domain HistoryProject.com sold for $403 at NameJet for a decrease of 84%. It last sold for $2,500 on December 11th, 2015 at BuyDomains. The domain IndustrialConstruction.com sold for $135 at NameJet for a decrease of 85%. It last sold for $913 on April 11th, 2007 at SnapNames. 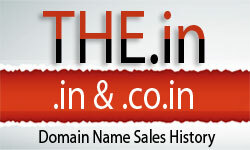 The domain RNP.net sold for $601 at NameJet for a decrease of 96%. It last sold for $14,888 on October 26th, 2011 at Afternic.